 When I first created Little Soap Company back in 2008 I was only too aware of the controversy over the use of palm oil in a wide range of consumer products. Because of this, and my genuine passion about and commitment to the environment I heavily researched the topic and from day one have carefully sourced all our oils from sustainable organic plantations and in the case of palm oil from accredited organic, RSPO-certified sustainable plantations. Yes this has made our soap more expensive but also allowed me to produce the most wholesome, rich and lathery organic, natural soap I believe is possible. The whole sustainability issue is vast and for that reason we have teamed up with our pals at the Sumatran Orangutan Society (SOS) to explain why and how we’re playing our part in breaking the link between palm oil and the destruction of orangutan habitat. Palm oil is a vegetable oil that is used in a lot of day-to-day products including food and cosmetics. Around half of the packaged food products in an average supermarket may contain palm oil. It used to be often labelled as ‘vegetable oil’, but following the Clear Labels, Not Forests campaign led by SOS, all food packaging in Europe now has to list it specifically in their ingredients. There is no such requirement for the labelling of cosmetics and other products yet, but we choose to let our customers know exactly what is in our products. The oil is extracted from the seeds of the oil palm tree, which originated in West Africa. It is now grown around the tropics: in south-east Asia, Africa, and Latin America. Whilst there are many small growers of palm oil, it is also regularly grown in very large plantations with the seeds sent to mills in the same country for processing, and the resulting oil being distributed worldwide. Indonesia and Malaysia are the top two palm oil producing countries in the world. Oil palms produce more oil per hectare of land than any other vegetable oil crop, making it the world’s cheapest vegetable oil. As global demand for this cheap and versatile vegetable oil grows, plantations are expanding, and vast areas of rainforest are being cut down to make way for them. These areas are often vital habitat for endangered species such as the Sumatran and Bornean orangutan, Sumatran tiger, Sumatran rhino and Bornean and Sumatran elephant. The forests also store huge amounts of carbon, and many stand on peat soils which hold massive additional carbon stocks that can be released when the forest is removed – bad news for the global fight against climate change. Forest conversion is not an essential element of the industrial production of palm oil – it can be grown on ‘degraded’ and non-forest land, but forests are still falling as the government and companies can benefit from establishing new plantations in areas of rainforest, such as through selling the timber from logged areas before setting up the new plantation. The price of palm oil could drop, actually increasing demand in other areas of the world such as India and China, and for uses such as biofuels. We do not believe that boycotting palm oil is the answer – instead, we want to play our part in transforming the industry. We are a small company but we want to add our voice to the growing call for palm oil companies to produce responsible palm oil, and stop clearing forests. Many companies around the world have made zero-deforestation commitments, and we are reaching a tipping point where demand for responsible palm oil will drive big changes in the way the oil is produced. 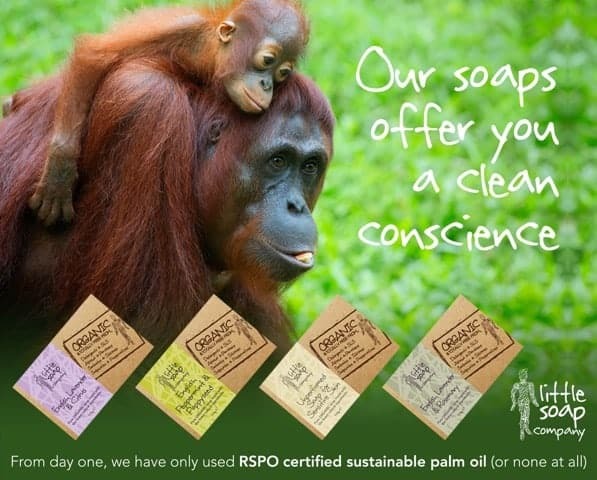 Little Soap Company has pledged to use only organic, certified sustainable palm oil in our products, which means that the palm oil has been produced without harming the rainforests that orangutans and so many other species depend on for their survival. We recognise that the Roundtable on Sustainable Palm Oil (RSPO), the body that oversees certified sustainable palm oil, is not perfect. The Sumatran Orangutan Society and others are working hard to make it as strong a standard as possible, and by supporting SOS, and insisting that our suppliers source palm oil only from traceable plantations that have not contributed to deforestation, we can be confident that our business and our customers are helping to keep forests standing and orangutans and other wildlife safe. SOS is a conservation charity working to secure the future of the critically endangered Sumatran orangutan and their forests. They support frontline conservation programmes and campaign on issues threatening the survival of orangutans in the wild. Their projects include rainforest restoration, orangutan rescue and developing community conservation initiatives which support the protection of the Leuser Ecosystem, empowering local people to become guardians of these precious forests.